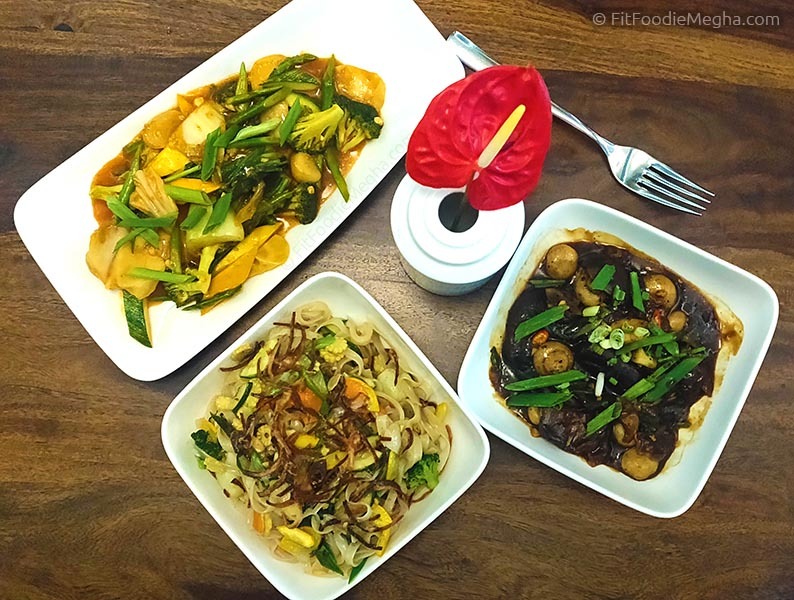 Fit Foodie Megha: Viet:Nom – Authentic Vietnamese Food in Pune at The Gateway Hotel — Reviewed! 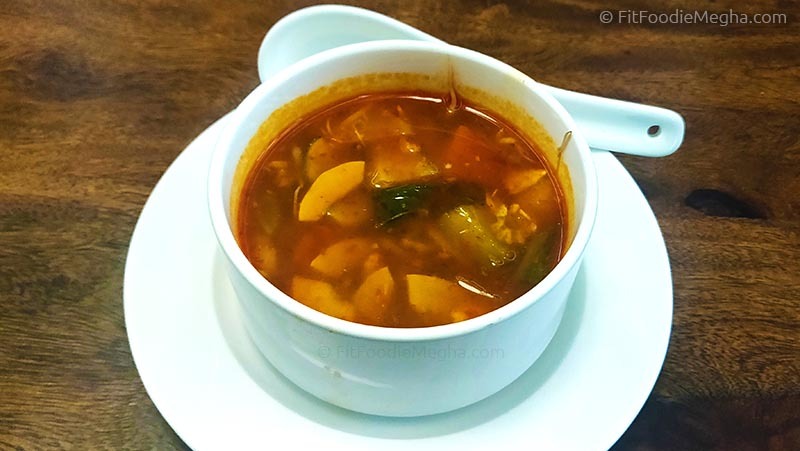 Viet:Nom – Authentic Vietnamese Food in Pune at The Gateway Hotel — Reviewed! Vietnamese Food is quite under-rated and not much popular in Indian restaurants. 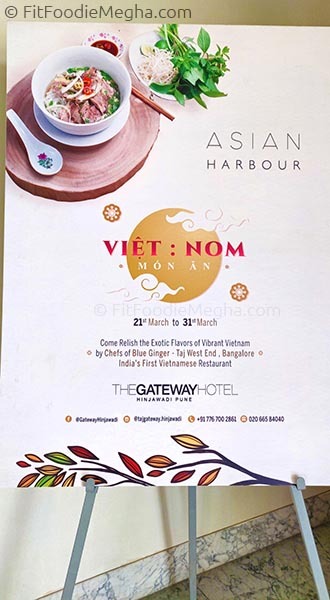 Asian Harbour at The Taj Gateway, Hinjewadi, Pune is hosting a Vietnamese Food Promotion –"Viet:Nom" for a limited period (21st March 2019 to 31st March 2019). 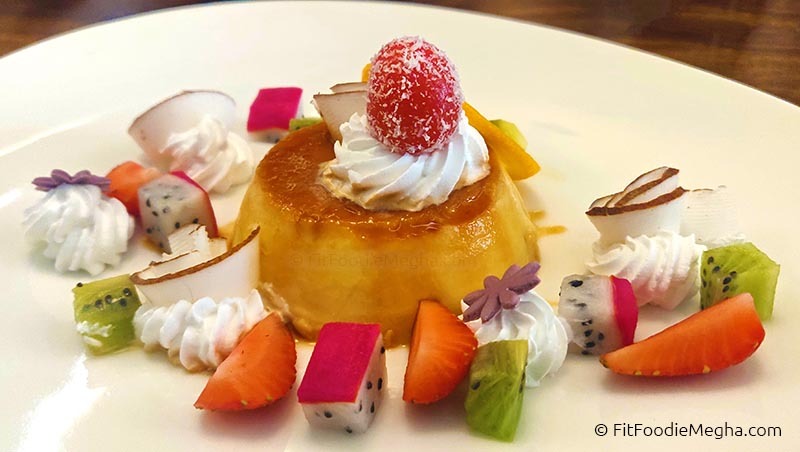 To provide unique authentic gastronomic experience to the aficionados of Pune, Chef from Taj West End, Bengaluru has been brought in to the city. He hosts one of India's first Vietnamese Restaurants – Blue Ginger where the cuisine is done with perfection. Started our lunch with the light, refreshing, healthy Vietnamese Raw Papaya Salad (Rs.500). 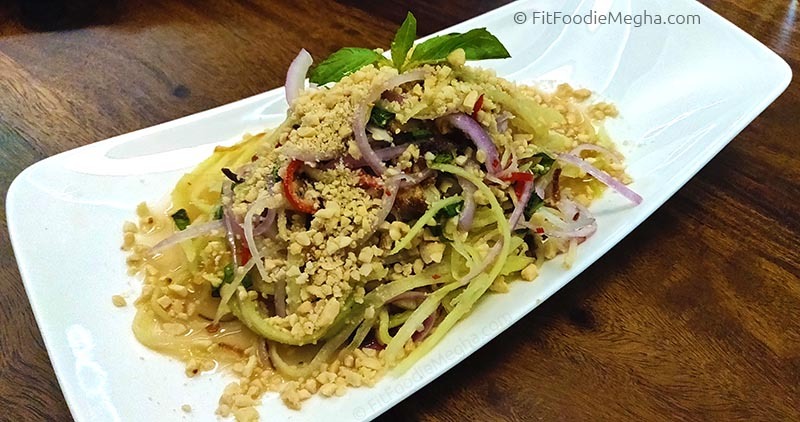 Dressed with light, tangy dressing with loads of lemongrass, bit of chilli with the crunch of peanuts. Burst of flavours in this cold salad. 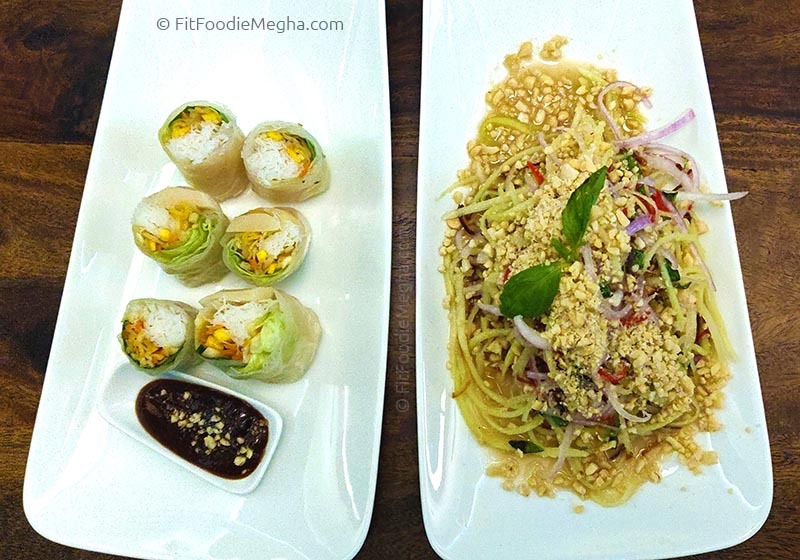 Rice Paper Summer Rolls (Rs.500) were served next. 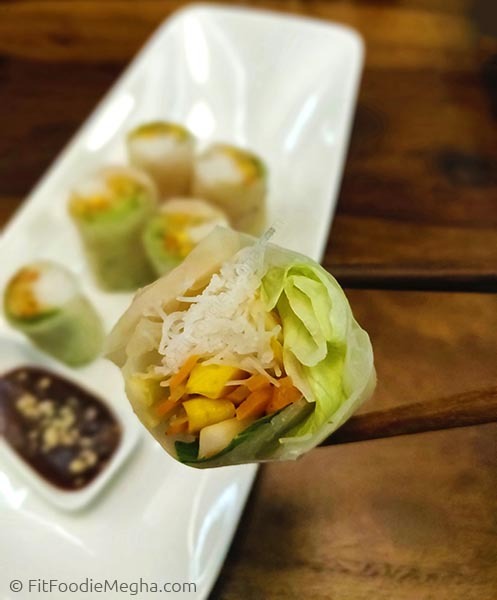 Fresh vegetables and water chestnuts wrapped in transparent rice paper sheets, this appetizer is not only simple but healthy too. The veggies were seasoned well. 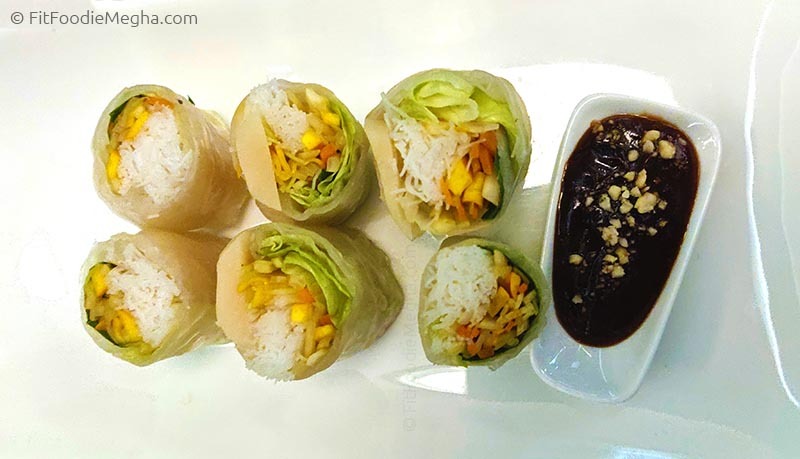 The rolls tasted best with the Tamarind and Hoisin Sauce. Excellent preparation. 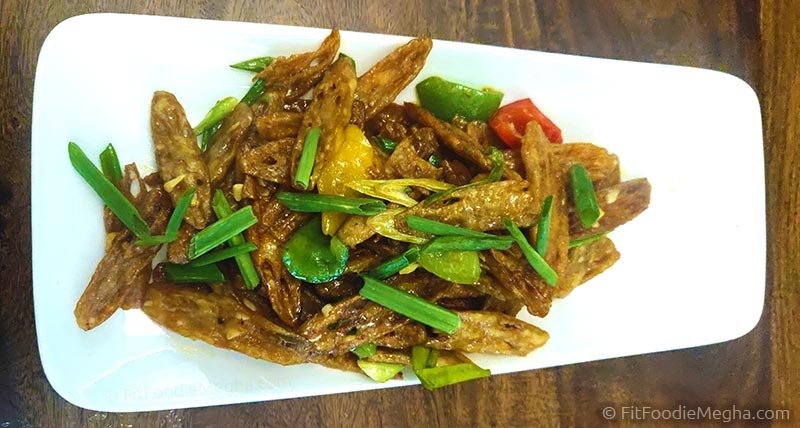 Next served was the Crispy Lotus Stem (Rs.500). Super delicious! 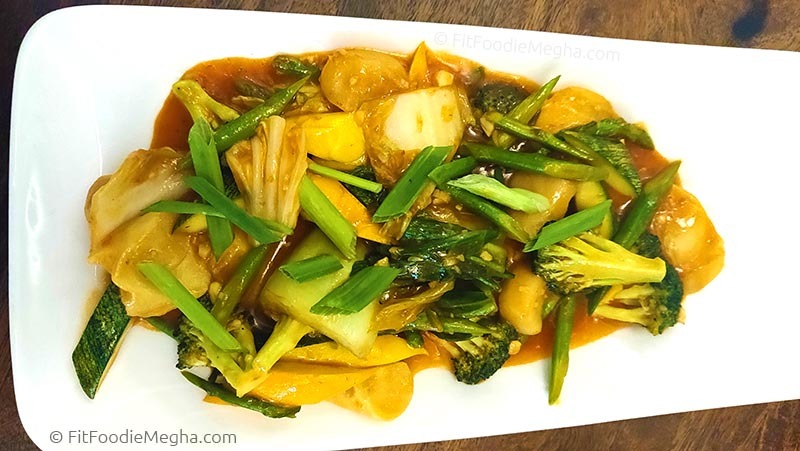 Unlike other places serving sweet and tangy Honey Chilli Lotus Stem, this one was prepared in Garlic Butter Sauce and even after 15 minutes, the lotus stem were crisp and full of buttery flavour. The garlic was mild. Highly Recommended! So, that's the fun part of tastings, when you get to learn something. Here, we were introduced to the Vietnamese style of grills. 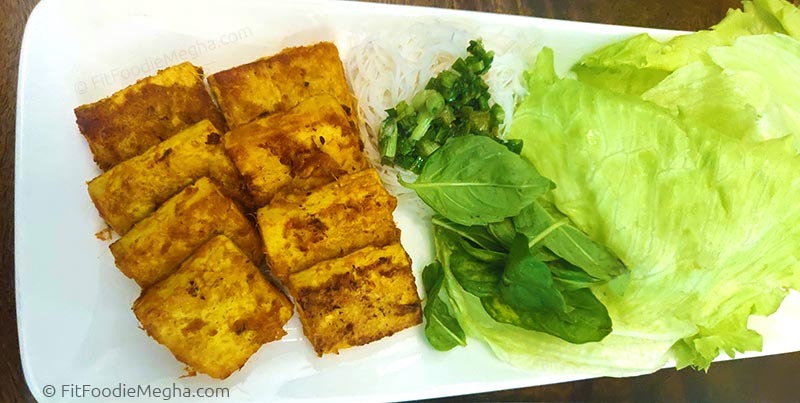 The meat/tofu/veggies are perfectly marinated especially in the anato oil and curry powder and to devour it you need to wrap a tofu into the lettuce leaves with basil leaves, noodles, herbs, with some lemon drops. So unique, fun way of having "grills". From the mains we had Trio of Mushrooms in Fresh green pepper sauce. Three types of mushrooms were seasoned well with salt, pepper, oregano and garlic in the green pepper sauce. So delectable. 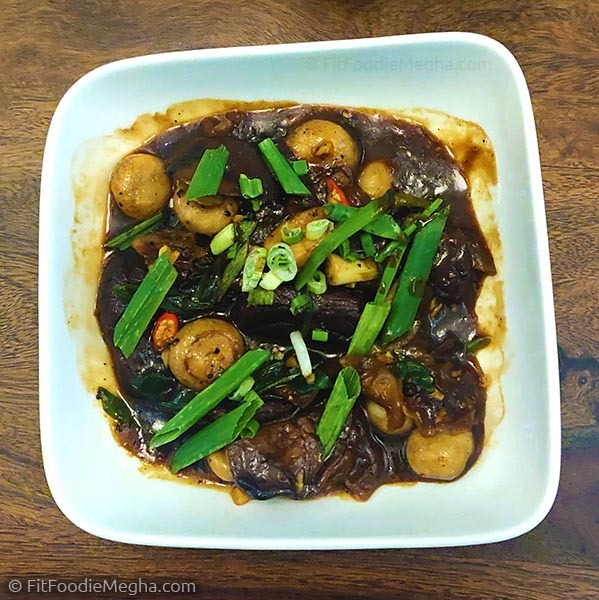 The crunch, sweet-tangy taste and the sauce qualified this dish as one of my favourites. Grilled Assorted vegetables in Saigon Sauce was delicious. The intense flavour of sauce was the hero. One of the finest main course was the Yellow Cari and Jasmine Rice and perfect homemade Baguettes. The Cari was similar to the Thai Yellow color but the consistency was bit thinner. Coconut flavour was intense and I loved it. 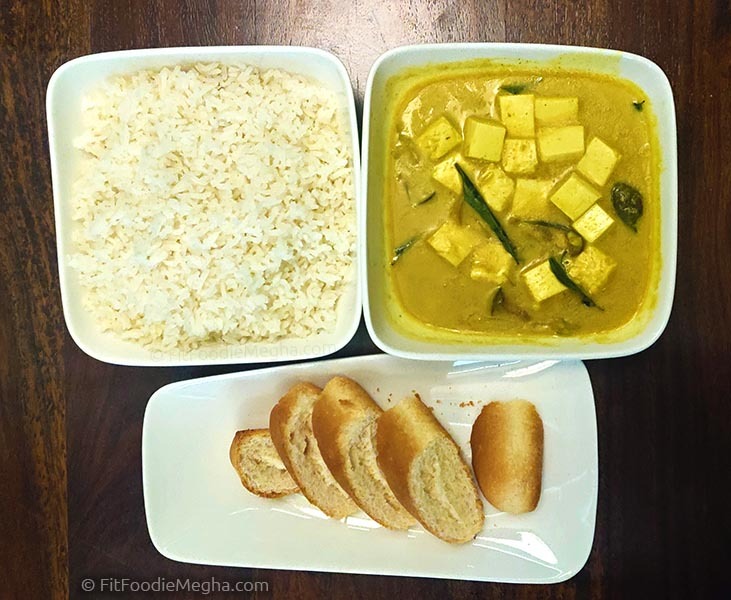 Lemongrass, Madras Curry powder and ginger elevated the taste to next level. With baguettes also, it was a delicious combination. 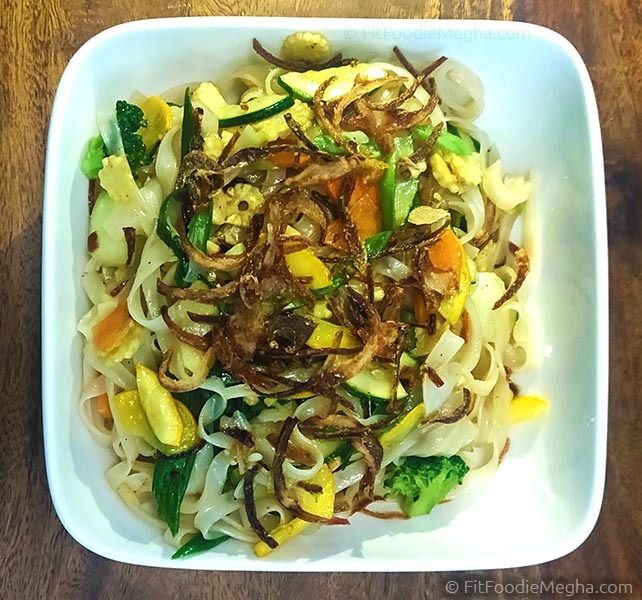 Rice Noodles were very light and healthy with assorted vegetables and caramelised onions on the top. One can devour like that or can pair it up with the curry. Super flavourful. 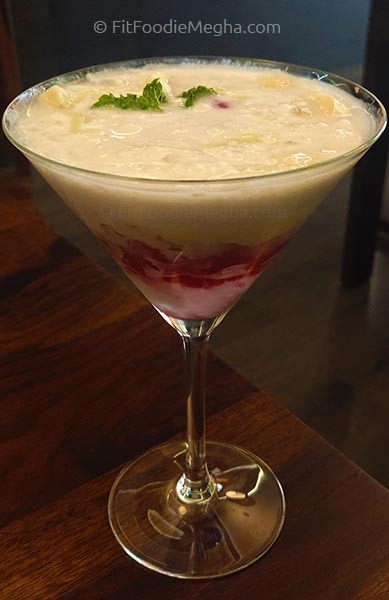 Last but not the least in the desserts we had Che Chuoi – banana with sago pearls and sweetened coconut milk (Rs.400). It tasted somewhat like Falooda but not too sweet. The coconut milk and banana was giving natural sweetness. But the star dessert was the beautifully presented Coconut Caramel Custard (Rs.400). 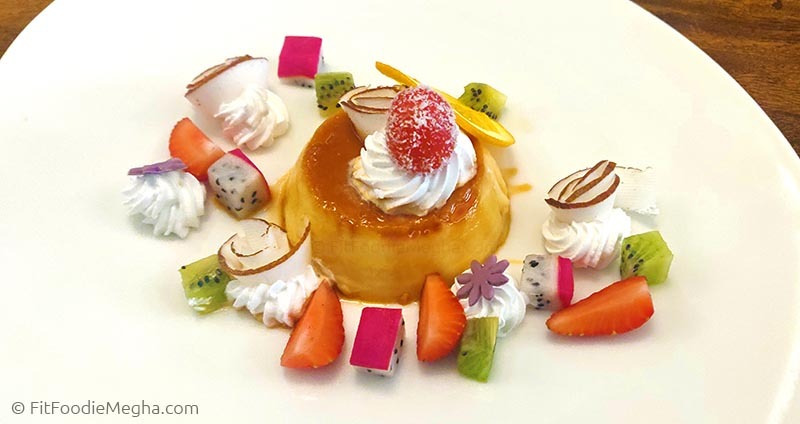 Silky smooth, creamy, sinful custard adorned with beautiful edible flowers was melt-in-mouth. Highly Recommended! Winded up the meal with the Vietnamese Cold Coffee! Perfect sweetness and finest coffee was loved by one and all. A must to beat the summer! However, there was change in quality when we ordered twice. Overall, it was a lovely experience and hands down to one of the most authentic Vietnamese Food in Pune. Definitely, a must visit! Chaat Affair at Nine Square – Reviewed! 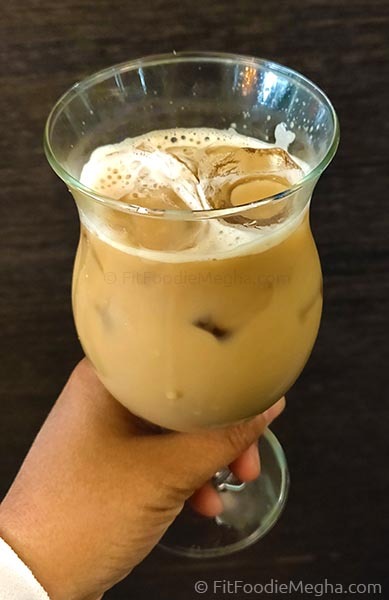 Cafe Paashh – Organic tasty treats! — Reviewed!